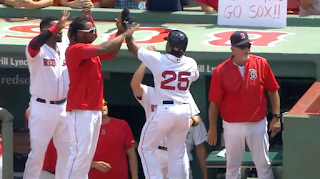 The Red Sox pounded out a season-high 26 hits in a 22-10 rout of the Seattle Mariners at Fenway Park on Saturday afternoon. Boston basically put the game out of reach with a pair of five-run innings in the second and third. 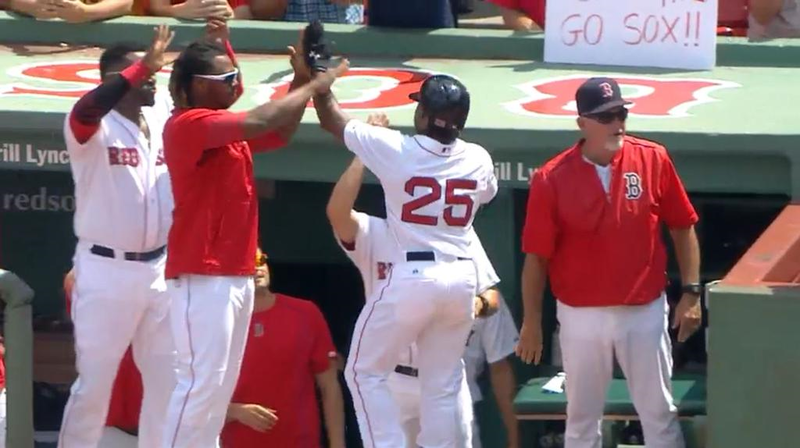 The festivities in the second included home runs by Pablo Sandoval and Jackie Bradley Jr.(pictured) The third inning featured an Alejandro De Aza two-run blast, and a two-RBI double by Brock Holt. Wade Miley allowed just two Seattle runs on four hits over seven innings. He walked three and struck out eight as his record improved to 9-9. His Seattle counterpart Felix Hernandez didn't get through the third inning, charged with ten runs on a dozen hits. Bradley, who has raised his average from .121 last Sunday to .250 continued his torrid stretch, leading the team with five hits including three doubles and two home runs. He scored five times and drove in seven runs in the win. Xander Bogaerts and Blake Swihart each had four hits. Sandoval left the game in the fourth inning after being hit by a pitch on the right elbow in the previous inning.